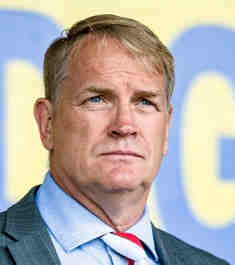 Colin Gordon is the current chairman and owner of the Harriers having formerly been a forward with us during the early 1990’s. Born in Stourbridge he began his career locally with Lye Town before joining Football League side Swindon Town in 1984 at the age of nineteen. From there he has also played for Reading, Fulham, Birmingham City and Leicester City before joining us to play twenty one games and scoring four times. On his retirement from playing the game he became a football agent with the likes of Steve McLaren, Theo Walcott and David James on his books. In April 2015 Gordon returned to the club as football development director and when Gary Whild left the club he became the caretaker manager for a short while. In the November of that year he, or his company G5, became the major shareholder within the club and so, effectively, the owner. In January 2016 he again took on the temporary manager job after Dave Hockaday was sacked and for a third time in January 2019 when he again undertook the caretaker manager role, along with James O’Connor and Russ Penn, following the dismissal of Neil MacFarlane.